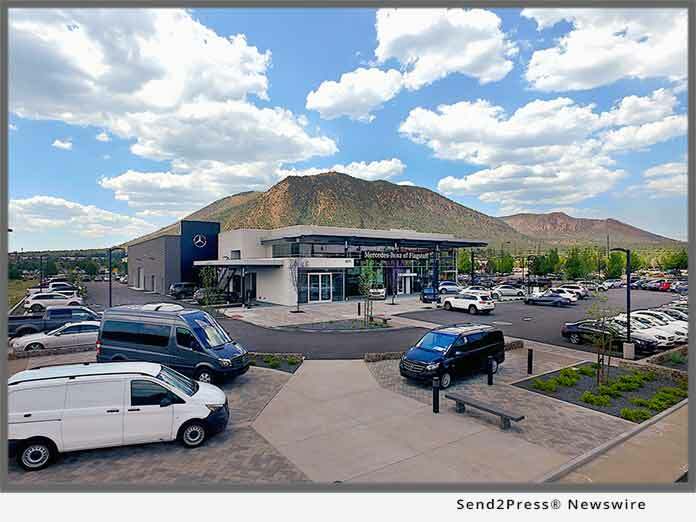 FLAGSTAFF, Ariz., Sep 12, 2018 (SEND2PRESS NEWSWIRE) — Mercedes-Benz of Flagstaff, part of Martin Automotive Group, celebrates their Grand Opening on September 21, 2018 as Flagstaff’s only luxury dealership. The Grand Opening event will bring together distinguished guests in the city, including the mayor, along with the invited public to celebrate the business in the beautiful state of the art facility. Alcoholic beverages will be provided by Canyon Diablo Spirits, Mother Road Brewery, and Breakthru Beverage Distributors. Gourmet catering will be provided by Mainstreet Catering and there will be live music and other live entertainment. Guests will have a chance to mingle with Mercedes-Benz enthusiasts and admire luxury vehicles on display. September 21 falls on National Prisoner of War Day, a day set aside to honor those who have been prisoners of war or missing in action. Mercedes-Benz of Flagstaff is honored to invite local veterans to celebrate with the community as well as be honored for their service. Additionally, Nation of Patriots will have an esteemed presence at the Grand Opening. Nation of Patriots is a 100 percent volunteer nonprofit national organization that seeks to support veterans financially, physically, emotionally, and economically as well as raise awareness about their situations so that their communities can support them. They work with Veterans Affairs as well as many other veterans organizations to best support and serve veterans. Mercedes-Benz of Flagstaff is proud to be a sponsor. Mercedes-Benz of Flagstaff carries the full line of Mercedes-Benz vehicles. It also houses a full service repair facility. Guests will be delighted to learn that the dealership is pet friendly. Michael Martin is the owner of Martin Automotive Group, an automotive group with 9 stores spanning 3 states. “The foundation of our business is built on the core values of excellent service and quality workmanship reflecting the pride we have in our company and the humility and appreciation we have for each of our guests,” Mr. Martin said. Martin Automotive Group is dedicated to delivering automotive excellence while providing both unprecedented customer service and an extraordinary workplace environment. Martin Automotive Group has dealerships in New Mexico, Arizona & California filled with dedicated automotive professionals ready to serve your needs. Martin Automotive Group is a genuinely caring organization living up to their core values of honesty, integrity and transparency in every detail, every day. Mercedes-Benz of Flagstaff is located at: 5171 Test Drive, Flagstaff, AZ 86001. For directions and more information, visit: https://mercedesbenzflagstaff.com/. Learn more about Martin Automotive Group at: https://www.martinautomotivegroup.com/.